You won’t believe how quick and easy this pressure cooker curry is! 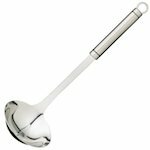 It’s perfect for an instant pot or any electric pressure cooker. Serve with rice for a healthy vegetarian dinner. We cook vegetarian quite a lot. It’s fun to find new ways to use vegetables and as good as vegetarian curries are we also love veggie versions of pasta dishes, Mexican stews and quick noodle recipes. 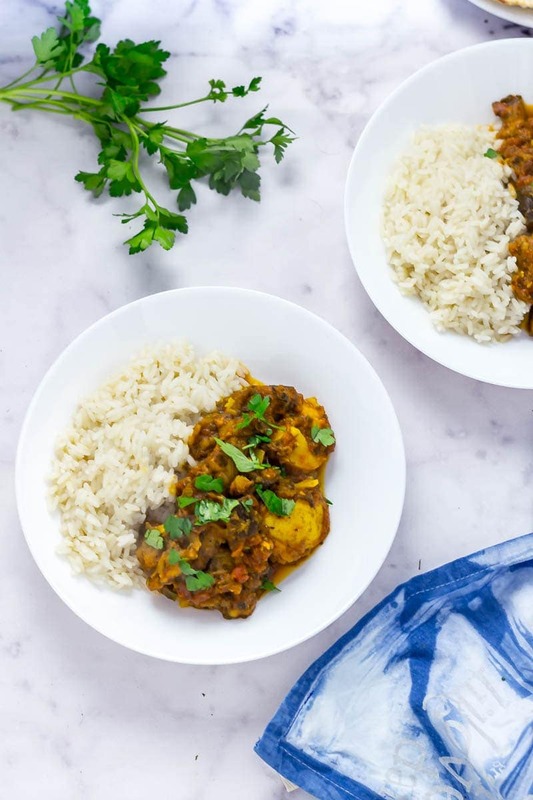 This pressure cooker curry is one of our favourite vegetarian recipes though, it’s so great to be able to have a vegetarian dinner on the table in a matter of minutes! So Will got me a pressure cooker for Christmas. We’d had a few conversations about them (since the whole Instant Pot thing took off) and he’d managed to convince me that I didn’t need one. Well, kind of, I obviously still wanted one but had resigned myself to the fact I wasn’t going to be getting one. Will claims that he actually wasn’t going to buy me one. That is until I got really sick before Christmas. I was stuck in bed for nearly a week and missed out on a lot of pre-Christmas fun which is pretty much the worst because I love the pre-Christmas time almost as much as the actual Christmas time. Anyway, Will felt so sorry for me that he changed his mind about the pressure cooker and went out and got one. He is a very good boyfriend. And that’s one good thing that came out of my being sick! So he was actually thinking of buying me the Instant Pot but they were completely out of stock before Christmas so he ended up getting me the Pressure King Pro and so far we have loved it. You can find my other pressure cooker recipes here (these are great Pressure King Pro recipes but will work with any pressure cooker or Instant Pot!). We’ve found it especially useful on nights we’ve been going out for a run, there’s a delay function which means that we can set it to cook just before we know we’ll be back from our run which is really handy and means we can have dinner minutes after getting home. Anyway, this recipe will work with any pressure cooker so give it a go whether you’ve got the instant pot or something else! 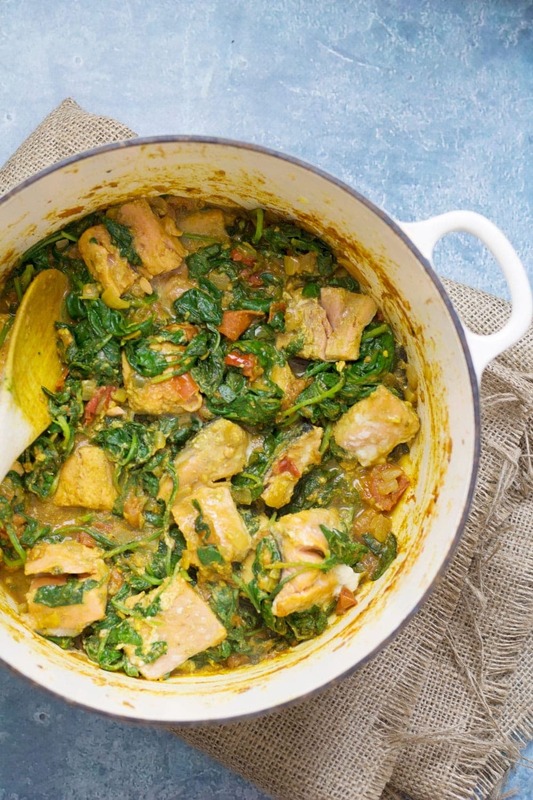 Curry is one of our favourite meals to make so I’m so glad we’ve found a way to make it so super quickly. 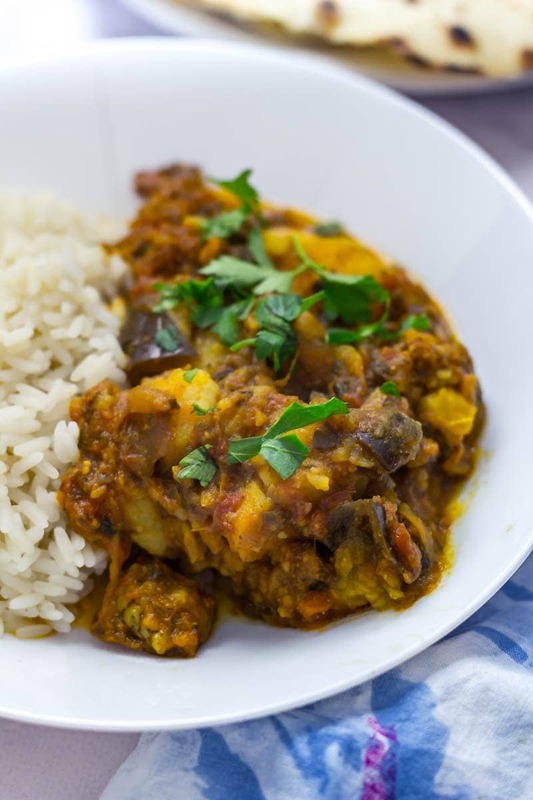 This version has potato and aubergine (eggplant) but you could definitely add whatever vegetables you like. 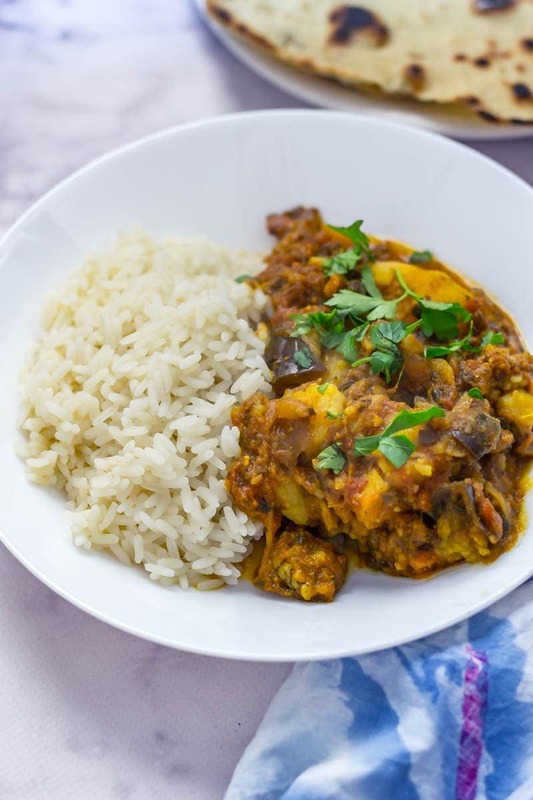 I know some people are a bit weird about aubergine but I’ve got some really fab aubergine recipes on the blog so check them out if you want to make better friends with this shiny purple guy. 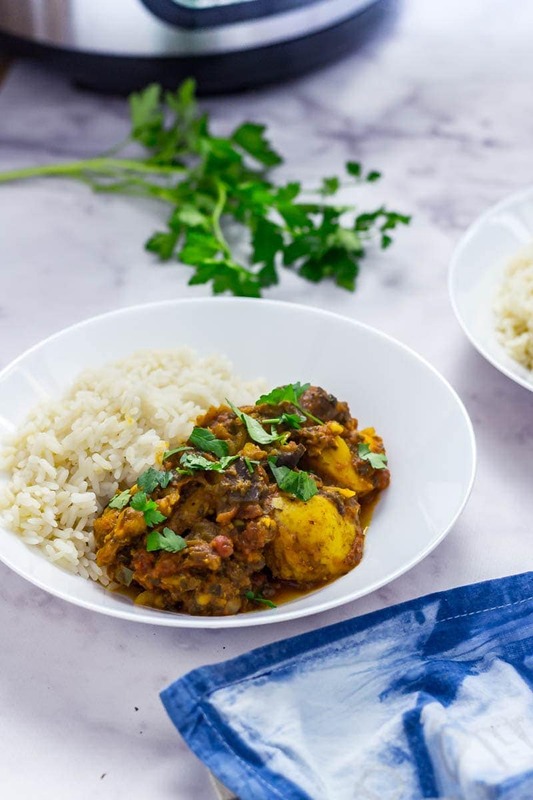 Oh, also, if you’re doing veganuary or going vegetarian or any other healthy January things then this curry is PERFECT for you (pressure cooker vegetarian recipes for the win, right?!). 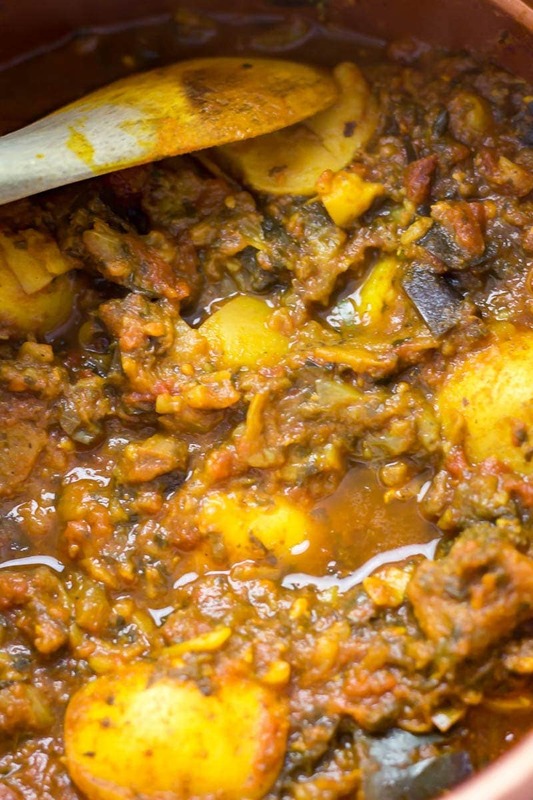 I’ve also used the pressure cooker to make a saag aloo which is similar to this curry but has potatoes cooked in a spinach based sauce instead and it’s so good! 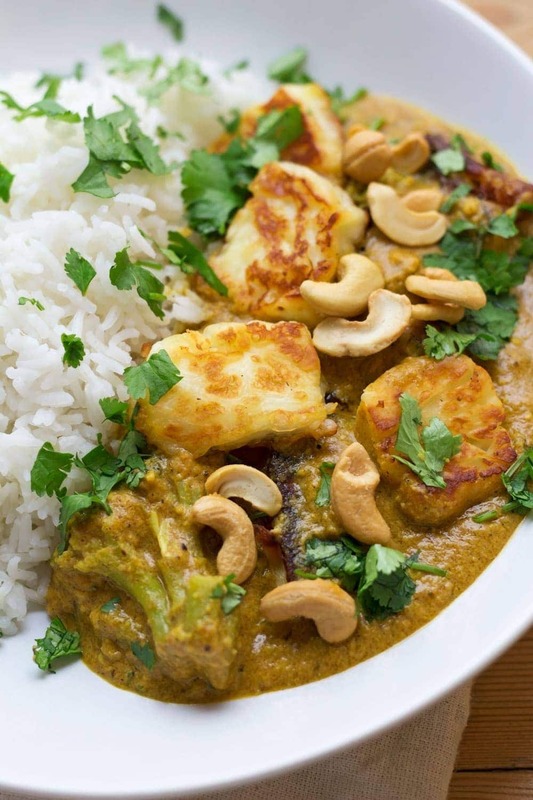 If you love making curries as much as we do then find all my curry recipes here! 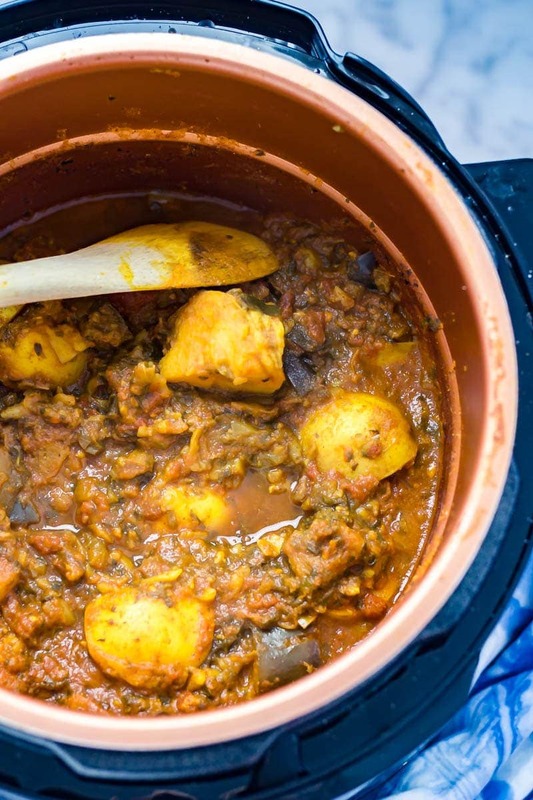 WONDERING WHAT TO DO WITH THE LEFTOVER INGREDIENTS YOU’VE GOT FROM MAKING THIS PRESSURE COOKER CURRY WITH POTATO & AUBERGINE? 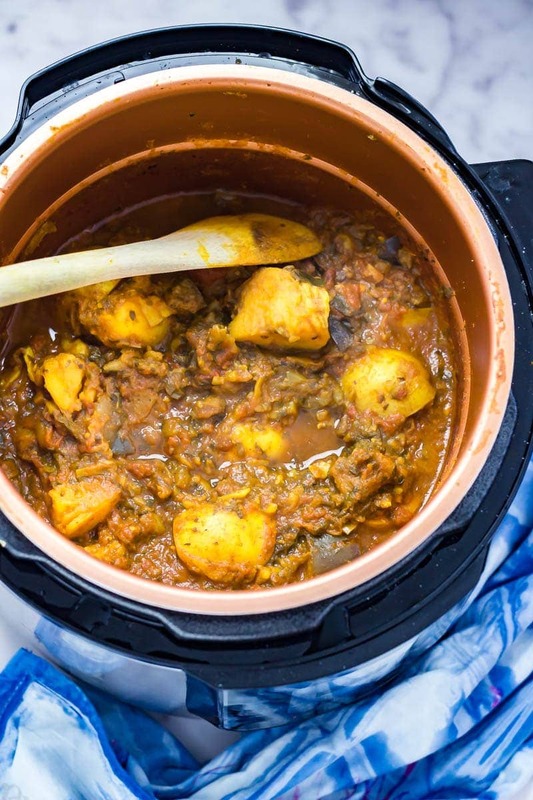 You won't believe how quick and easy this pressure cooker curry is! It's perfect for an instant pot or any electric pressure cooker. Serve with rice for a healthy vegetarian dinner. Put your pressure cooker into saute or browning mode and add the oil. Add the onion and cook for 2 minutes. Stir in the ginger, chilli and garlic and cook for another 3-5 minutes until everything has softened. Add the spices and cook until fragrant then stir in the aubergines, potatoes and tomatoes until everything is coated in the spices. Pour in the vegetable stock and tomato puree then put the lid on and seal. Cook for 3 minutes. I used the stew mode on our pressure cooker so use the equivalent on yours. Once it's finished cooking release the steam and serve with rice and chopped coriander. 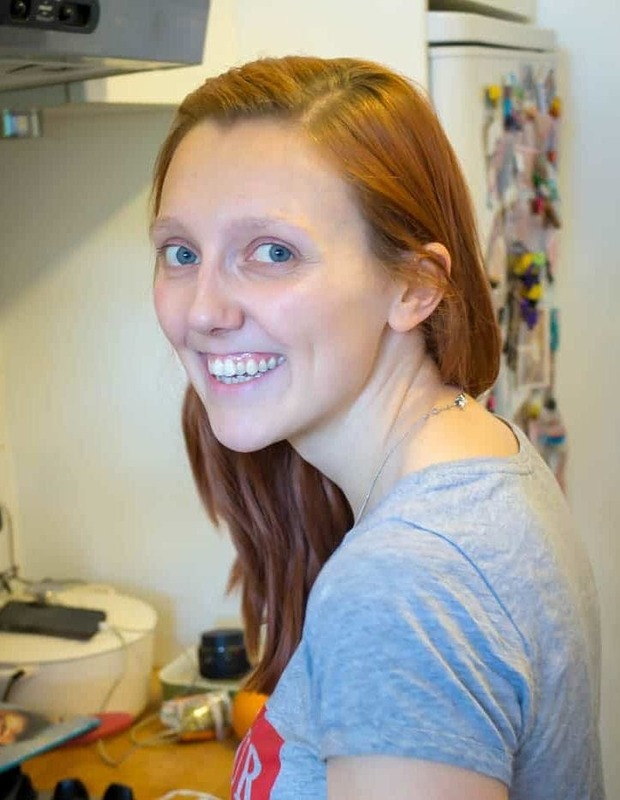 I am so sorry you were sick around Christmas – you do have a wonderful boyfriend though to have gotten you a pressure cooker! Btw, your curry looks fantastic! You have a very good boyfriend — I have an old-school pressure cooker with the little wobbly pressure gauge on top and everything — it still works like a charm, so no need for me to invest in yet another kitchen appliance, but I’ll definitely be trying your recipe! 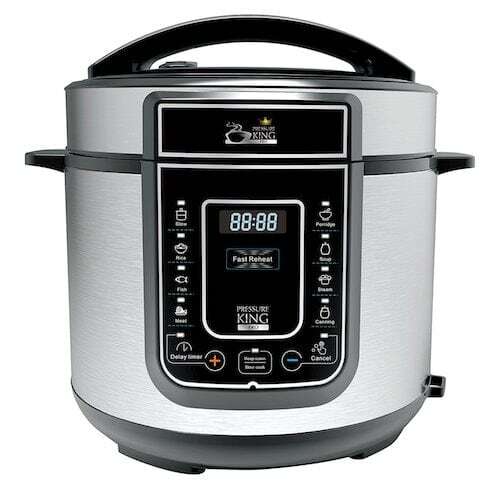 Looks like you are definitely enjoying your new pressure cooker! This looks like quite the comforting meal and so flavorful! 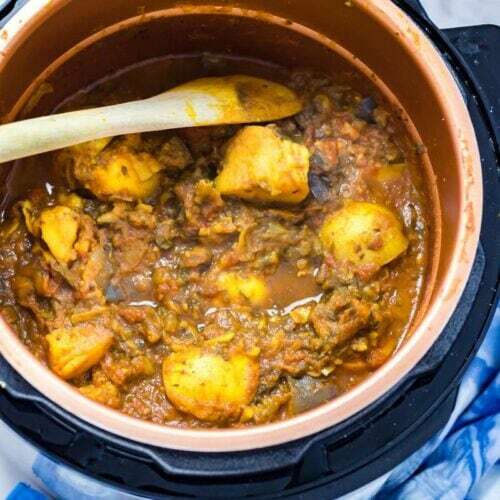 I love making curries, they’re my go-to quick and easy meal but now they’re even quicker with the pressure cooker. Must give this a try. Oh gosh I love this, can it be done in a slow cooker? I haven’t tried it but I think it would definitely work in a slow cooker! Made this last night and it was absolutely delicious. I hadn’t used the stew mode before but the timing was spot on, the potatoes were cooked through and the eggplant (aubergine to us!) was tender and melting. This is going in my favourites folder. This is so great to hear, I’m so pleased you liked the recipe! Can I ask do you also do the rice in your pressure cooker? If so do you do it after the curry (putting the curry to one side?